Look no further Waldorf Apartment Hotel is the essence of the search of many for a highly pleasurable and uniquely memorable stay in Sydney. Surround yourself with exceptional mountain views, and take part in the great number of leisurely activities that are accessible to you. The significant master bedroom is complete with a king size bed, a walk-in closet and an executive style bathroom attached. It has a large jet tub, a separate shower and his/hers sinks. Prepare your meal in the beautiful kitchen that has granite countertops, a walk-in pantry, ice and water dispenser and all the amenities that you will require. It is equipped with Cable TV, Wireless Internet, Laundry Facilities and a built-in audio system. 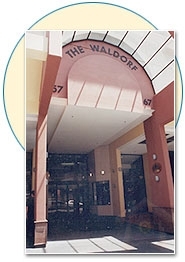 Waldorf Apartment is close to restaurants and eating joints survey varied dining options that which will enhance your taste buds and senses with some outstanding dishes. Waldorf Apartment vacation rental rents AUD170 per night. Rates are subject to change without notice. You will be very pleased with the peace and quiet that this resort will provide you.